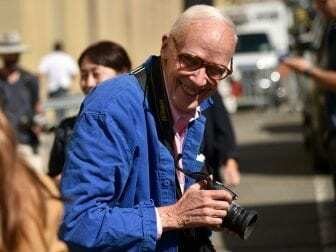 For decades, Bill Cunningham trained his eye — and camera — on New York City’s constant fashion parade for his New York Times “On the Street” and “Evening Hours” style columns. Bill Cunningham photographs guests leaving the Ralph Lauren Spring 2016 event during New York Fashion Week at Skylight Clarkson Square on Sept. 17, 2015 in New York City. Clad in his distinctive royal blue French worker’s jacket and often straddling a bicycle, the nonpareil people-watcher snapped outfits — some might say getups — that delighted him. Each week, he highlighted a different trend with a spectacular collage of photographs: black and white stripes, men’s ankle length furs, splashes of hot pink or bursts of yellow. Probably written in the early 1970s before he started at the Times, Fashion Climbing’s most interesting revelations are about Cunningham’s early years. But don’t expect a tell-all. Even Hilton Als’s introduction fails to fill in any blanks about Cunningham’s personal life or this manuscript’s path to publication. Written with more enthusiasm (and clichés) than literary panache, Cunningham’s memoir is a charming ode to being true to oneself. It charts his trajectory up fashion’s ladder, beginning as a stock boy at Jordan Marsh and then Bonwit Teller’s in the 1940s — an education he far preferred to Harvard, which he briefly attended in 1948. “My head was in a swivel of excitement as I crawled around the gorgeous clothes,” he writes with typical exuberance. As the fantastic photographs sprinkled throughout this book attest, Cunningham’s hats and masks were fabulously outlandish; standouts include a tip-to-toe portable cabana hat for those who, like him, hated the sun, and a beaded, feathered, and gilded extravaganza for a Beaux-Arts costume ball. Neither a wild octopus head-topper nor an oversized clamshell hat sold well — surprise, surprise. A more commercially viable invention was his foldable Fan Hat, which resembles an inverted, pointed cupcake wrapper. Fashion Climbing is a lesson in perseverance. Despite his family’s disdain and his “continual frustration” over the gap between artistic and commercial success, Cunningham is remarkably without bitterness. “Thank God I didn’t give a damn about money,” he writes. He mourns the demise of hats and the subsequent loss of his millinery business in the early 1960s, but moves almost seamlessly into fashion reporting. He captured that vital breath right to his last.